The book and the library card that was still in the back. “American Railway Transportation” by Emory R. Johnson, Ph. D., was first published in 1903. Today’s mystery is this: How and why did a 1907 edition of this 434-page book end up hidden in the wall of a house at 1405 Front Ave. N.E. instead of being returned to the Albany Public Library when it was due in (I’m guessing here) 1935? As I mentioned on this site on Feb. 2 and again on the 5th, the old house on Front dates from 1900 and is about to undergo restoration. Sean Sullivan of Superior Carpentry and Homebuilding, who is tackling the job, told me Monday that the book, in good condition, turned up in one of the walls as the sheathing came off. He surmised that houses in that east Albany neighborhood near the Willamette River might have been built for railroad families, and the book’s title and subject seemed to fit right in. 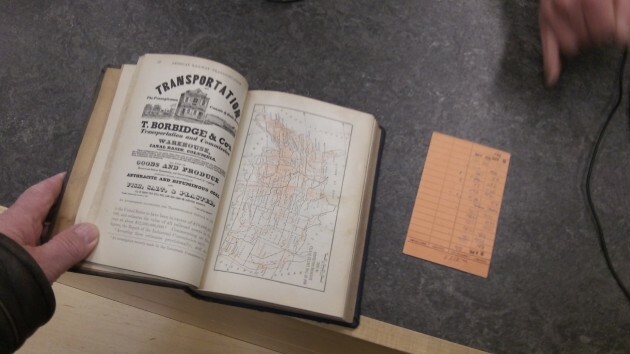 The book had belonged to the Albany Public Library. That’s where Sullivan returned it and where I went to take a look. The book had been borrowed by D.W. Lovett, according to the library card still stuck in its pocket inside the back cover. The “special privilege non-fiction card” identified its holder as someone who sometimes returned books in as little as two days. The card tracks the dates but not the years in which it was used. But on two lines it says “33.” If that indicated a year, then the intervening dates stamped on the card suggest that the book was checked out on April 24, 1935, and not returned. The card pocket says borrowers will be charged 1 cent for every day a book is past due. At that rate, the fine on this one would be about $295. The library card says D.W. Lovett lived on E. Water Avenue, about a block from where the book on railway transportation ended up in a wall. He might have been — but I can’t be sure — the Dallas W. Lovett listed in the Albany Directory of 1955 as then living in the 600 block Montgomery Street. His occupation: Southern Pacific yardmaster. What about the author? Emory R. Johnson was a professor of transportation and commerce at the University of Pennsylvania. But that’s not all. He also was a member of the Isthmian Canal Commission from 1899 to 1904. Construction of the Panama Canal would start the year his service on the commission ended. A great bit of sleuthing – and follow-on story. Thanks! I seem to recall a Dallas Lovett that sold real estate in his later years. But he lived by the freeway on Century Drive near the Mennonite Church. A very fine man. Not one to hide a book not his. This house it not undergoing restoration, it’s soul is being destroyed. Restoration is “the action of returning something to a former owner, place, or condition”. From time inappropriate windows, roof slope lines, you name it, there is nothing in the plans shown earlier that look remotely like a restoration. Please throttle back Gothic. Let’s consider the work to be rehabilitation or “rescue”. If the saltbox design were viable, the additions never would have been built, so a true restoration won’t sell. Centrist, you can call it whatever you like, but the fact remains that the house is being destroyed as part of its “rescue”. And why do you think a true restoration won’t sell? Try telling that to the guys that did a true restoration on SE 4th street and well able to sell it. I’m the contractor working on this property. I haven’t had the chance to read Hasso’s articles until now. First, great research on the book. You (Hasso) did what I wanted to do but couldn’t, thank you. Second, I am happy to see and a little shocked at all the debate over this little old home. I would like to say to Gothic that I appreciate your your passion and opinions. I noticed you mentioned and defined the word restoration. Well I never said we were restoring this home but instead trying to rescue it. If it was implied that we were restoring it, then I apologize. If we were to restore it according to your literal definition than we would have to demo atleast half to the existing structure to bring it to the house proper. This would leave a small two story home with a chimney running center between the two levels. The upstairs more than likely would have been one large room the family slept in. Downstairs would have been the place to cook and heat the house with the wood stove and do all things not associated with sleeping. To restore it according to your definition, then this place would have no running water or indoor bathroom facility. If we did that then it might make a nice stop on a museum tour, but it wouldn’t be habitable in today’s standards. We had a choice: tear it down or rescue it. In all logic it was so debilitated it had more going for it to tear down. However, something spoke to us and we all agreed this home needs to be rescued. When I think of a rescue I think of giving life to something that could die. However, sometimes when you “rescue” you can’t save every original aspect. Instead, you do your best to give life back to the thing you rescue and give it a second chance. Much like a dog I know that got rescued after being hit. They saved his life but he lost a leg. We want to rescue this home’s history, its existence, the memories that it holds and lives that have past through it. But like that dog, it might lose a leg. Our hope in updating it, is to keep enough of the existing features and shape so that you can still see this ole sentinel peering out through its new form to remind us of the time and history it holds. And, to build it up and make it a strong beautiful home that will last another 115 years and be able to house the memories of the the families that will pass through it in that time. In my opinion (not a Websters definition) the “Soul” of the house is not the wood, lath, plaster, siding etc., but instead the lives that have found a home inside her old bones… The memories created and the moments experienced. All the hugs, kisses, fights and laughter, the good times and bad, the hopes, dreams and disappointments and surprises; those things make up the soul of the home. Therefore, we aren’t destroying its soul, but instead giving the soul life, a second chance and opportunity to live on in the people that will enjoy its existence. I do appreciate everyone’s opinions, and you make it clear to me that this is not just an ordinary “flip”, but to respect how this home is drawing out the passion of this community and to do our best to give your love for older homes justice in this project. Thank you for that. Thank you Sean, for your great explanation of what you are doing. It seems to me that you care about the rescue.